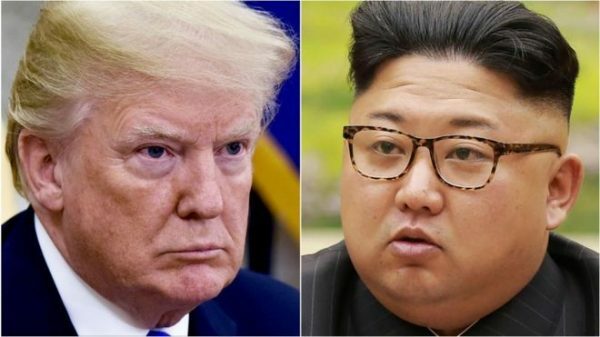 The day after he gave himself an A+ on his presidential performance, President Donald Trump unexpectedly canceled a crucial trip to North Korea by Secretary of State Mike Pompeo, all but acknowledging that his strategy to end the North Korean nuclear threat has so far failed. Trump, you’ll recall, had already declared that North Korea was “no longer a nuclear threat” after he met with the country’s leader, Kim Jong Un in Singapore last June. He had humble-bragged that “everybody thinks” he should win a Nobel Peace Prize over his dazzling diplomatic achievement. And, in words reminiscent of the infamous “peace for our time,” speech by Neville Chamberlain (“Now I recommend you to go home and sleep quietly in your beds”), Trump told us “Sleep well tonight” after his lovefest with Kim. But the troubles that came after the Singapore summit were not just predictable, they were widely predicted. Two months after declaring victory, it’s clear that Kim is not interested in dismantling his nuclear program, no matter what he promised Trump. Earlier this week, the United Nations nuclear watchdog, the International Atomic Energy Agency said it finds no sign that North Korea has stopped its nuclear activities. And yesterday, an expert group said the North has stopped dismantling its missile testing site, breaking another promise. The North’s missile program aims to find a way to launch a nuclear weapon at a target far away, such as the United States. The hawkish National Security Adviser John Bolton had already noted that Kim is failing to take steps to denuclearize. The North has even refused to provide a list of its weapons programs, a basic requirement for successful negotiations. Trump, who liked to mock previous presidents, especially Barack Obama, for not solving the problem, fell into the exact trap that his predecessors did. Kim Jong Un, like his father and grandfather before him, tricked the US President into making major concessions in exchange for small adjustments and big promises. To be sure, it is a positive development that Trump has walked away from his own threats to launch a nuclear war, and it is heartwarming to see the family reunions between small numbers of elderly South Koreans and their relatives in the North after decades of unforgivable separation. Still, the stated objective of Trump’s policy is to bring about the denuclearization of North Korea, and at this moment there is absolutely no sign that that it will happen, no matter how much Trump has slathered praise on the country’s young tyrant. The summit alone gave North Korea and its dictator a prize that had eluded his dynastic predecessors. Three generations of ruling Kims wanted the recognition of a face-to-face meeting with the American President. What should have been the reward for a successful negotiating process, instead came at the start. Another mind-boggling concession was the cancellation of US military exercises with the South. Trump strengthened Kim immeasurably not just by meeting him but also by praising him as a man who “loves his people, loves his country,” and wants good things for them. The man who presides over one of the world’s most brutal regimes now hears not a word of criticism about those actions from the American President. Even Trump’s tweet announcing the cancellation of Pompeo’s trip included a “Warmest regards and respect” to Kim. Trump said he looks forward to seeing him soon, a sign that he wants to continue with this highly personalized brand of diplomacy. As Trump admitted, his trade war with China, North Korea’s only ally, has complicated negotiations. But that should hardly come as a surprise. In fact, Trump has broken with the advice of experts, and the result has been as predicted. If diplomacy with North Korea stands a chance of success, Trump — despite his stratospheric self-confidence — will have to listen to better-qualified negotiators. Pompeo’s appointment of the respected Stephen Biegun as a North Korean envoy could make a big difference — as long as Trump, who fancies himself a great deal-maker, allows him to do his work. Trump may claim his presidency is a raging, unprecedented success on all fronts. But so far, his North Korea policy can charitably be graded an Incomplete, if that.